Oklahoma Farm Report - First Case of Stripe Rust Discovered in South/Southwest Oklahoma in Wheat Field Near Jackson Co.
First Case of Stripe Rust Discovered in South/Southwest Oklahoma in Wheat Field Near Jackson Co.
"During this past week, the first observation of stripe rust was made in Oklahoma in southern/southwestern Oklahoma in Jackson County where Gary Strickland, Extn. 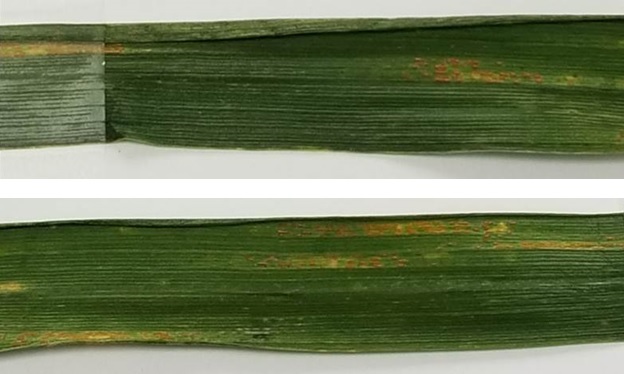 Educator at Jackson County in SW OK, and Mike Schulz, Altus Station Superintendent, found a low incidence of this rust on wheat in a variety demo and in a producer’s field. Leaf rust also was observed at a low incidence as was leaf spotting due to Septoria/Stagonospora. David Nowlin, Extn. Educator at Caddo County in central Oklahoma, also continued to observe leaf spotting. In scouting variety demos in Washita and Kiowa Counties, Heath Sanders, SW Area Extn. Agron Specialist, did not find any powdery mildew, leaf rust or stripe rust. "Around Stillwater, not much has changed. Wheat is mostly between growth stages 8-9 (flag leaves emerging to flag leaves fully emerged). I can still find hot spots of aphids (primarily bird cherry-oat aphids) along with scattered powdery mildew and a low incidence of leaf rust. Leaf spot diseases also are scattered and only on lower leaves. Finding stripe rust this late and at this low of an incidence typically indicates that stripe rust will not be much of a problem this year in Oklahoma especially when coupled with limited reports of this rust in Texas. However, leaf rust still has plenty of time to develop, especially if temperature and free moisture on leaves continues to be favorable."